The new kit includes our new version 2 inkset with significant fade resistance, larger 125ml ink volumes per bottle, and the flushFill clips + syringe for flushing/priming as required. The standard refill bundles are designed for customers who already printing in volumes and the most economical package for seasoned refillers not just testing things out. 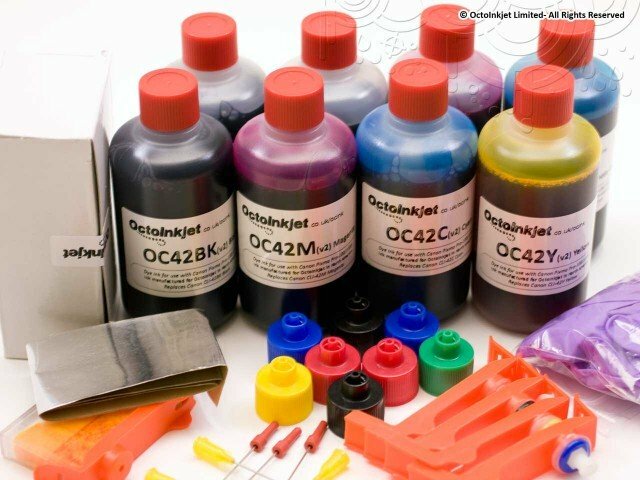 "I have been using Octoinket's inks for four years now. I had been using inks which were of German manufacture, and which were good, although there were some problems. I purchased Octo's inks and were quite pleased with them. I was asked to be a beta tester for the new inks which came out I believe earlier this year. I have been using them for awhile now, and have to say that they are wonderful. Rich colors, bright brilliant yellows. As I go through phases where I am printing alot for a month or two, and then leaving the printer idle for a few months, I am delighted to say that the inks have not dried out in the meantime and the colors are fresh as they ever were. Martin has been incredibly helpful and is always there if there are any problems and he does his best to help. I have rarely encountered such fine customer service anywhere. The new needle fill method makes refilling a much cleaner and easy process, and for me these inks will last a long time. Sincere thanks to Martin and his team for this product which has saved us a fortune in OEM cartridges over the years."